Microsoft made its foray into the “personal computer” market back in 2012 with the launch of the original Surface — notwithstanding the tabletop computer with the same name that the company showcased at CES 2008. 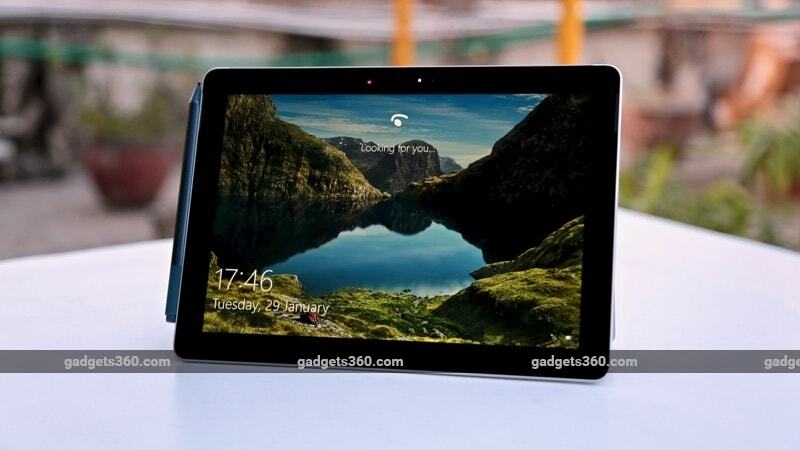 The first Surface was a Windows RT device designed to compete with Apple's iPad at the top end of the tablet market. While the Windows RT experiment came to an end pretty quickly — the Surface 2 was the last Microsoft device to ship with the version of Windows optimised for ARM devices, as Microsoft switched to “regular” Windows even for its tablets — the Surface name has lived on, and indeed thrived. The company has announced several Surface devices in recent years, and we've seen the line evolve from tablets and hybrid 2-in-1s to form factors as varied as the Surface Studio and the Surface Hub. What they've all had in common is the fact that they are premium devices designed to showcase the best of what Windows has to offer. With the launch of the Surface Go, Microsoft aims to make the Surface experience available at a more accessible price point, with the entry-level model starting at Rs. 37,999 in India. A tablet with a price tag of nearly Rs. 40,000 sounds like an expensive proposition on paper, but does the flexibly of running Windows 10 enhance its value proposition? 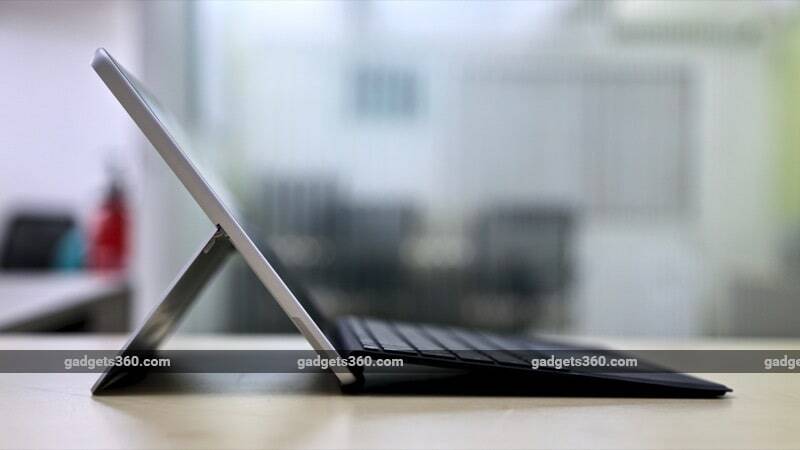 Should the Surface Go be your pick if all you need is a premium tablet? Let's answer all these questions and more in our Surface Go review. From the front, the Surface Go looks like a pretty standard tablet with fairly thick bezels on all sides of the screen. The bezels seem rather old-fashioned compared to present-day smartphones, and even the iPad Pro to a lesser extent. With that said, the Surface Go doesn't look too dissimilar to the 2018 iPad, for example, though the iPad does have thinner bezels on the sides. The 2018 iPad, of course, also features a home button, while the front of the Surface Go is completely devoid of any buttons. The back and sides of the device are a lot more interesting, and where the Surface Go starts to look and feel like a premium device. The top side (when the device is propped up with the kickstand) has a grey strip that houses the power and volume buttons towards the top. The strip extends on to the back, where you'll find a camera module and a noise cancelling microphone in the centre, giving the back a two-tone finish. The right has a headphone jack, a USB Type-C port, and a proprietary port called Surface Connect that's used for charging and for connecting accessories like the Surface Dock. 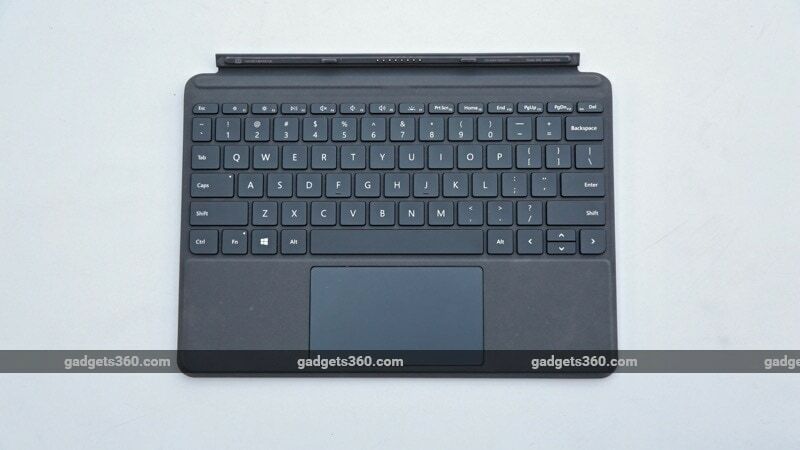 The bottom edge has the Cover connectors for you to snap on the Surface Go Signature Type Cover, which, of course, is sold separately. The most important design element of the Surface Go is the kickstand at the back. By default, the stand sits flush with the rest of the body, but it can be easily popped out to prop the tablet at various angles (up to 165 degrees). A microSD card slot sits behind the kickstand and is rather easy to miss. The kickstand feels solid, and stays in place when you need it to, while still making it easy to change the angle as and when needed. Of course, the kickstand works great when you are working on a table, but initially we had reservations about how the experience would be while using it on the lap. As it turned out, our fears were unfounded, and using the Surface Go on our lap wasn't much different than, say, using the iPad Pro with its Smart Keyboard. At 245 mm x 175 mm x 8.3 mm, is marginally bigger than the 2018 iPad, but at 10-inches — compared to 9.7-inch on the iPad — you also get a screen that's a little bit bigger. At 522g, it's also slightly heavier than Apple's tablet, but still portable enough to be lugged around without any problems, even when you throw in the extra weight of the Type Cover (more on that later). The Surface Go is powered by the Intel Pentium Gold 4415Y processor with integrated Intel HD 615 graphics. The Pentium Gold line of processors sits between the Intel Celeron and Core i3 lines, so that should give you an idea of what to expect in terms of performance. Though Microsoft doesn't officially share the clock speed of the chip, a quick look at Intel's website shows that the 4415Y is a dual-core (four threads) chip with a base frequency of 1.6GHz. In India, the Surface Go is available in two variants — one with 4GB of RAM and 64GB of eMMC storage priced at Rs. 37,999, and the one we had in for review, with 8GB of RAM and 128GB of SSD storage, priced at Rs. 47,999. You'll get 44GB and 97GB of usable space respectively on the two variants. 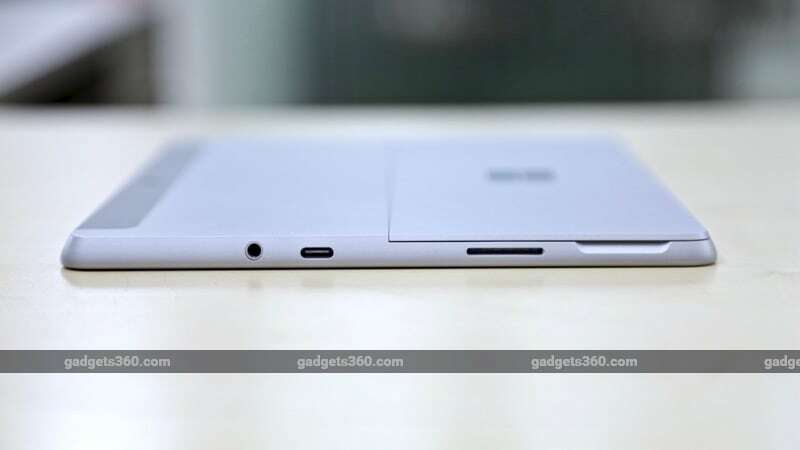 Microsoft hasn't yet launched variants with LTE in India, so your connectivity options are limited to Bluetooth 4.1 and Wi-Fi 802.11ac. As you might have noticed, you get a Type-C (USB 3.1 Gen 1) port on the Surface Go, but there are no full-sized USB ports, which means you will need to embrace dongles if you want to use your existing USB drives and other accessories. There's no USB Type-C to Type-A dongle in the box. Like Apple with the iPad Pro, Microsoft is positioning the Surface Go as a laptop replacement, which makes the keyboard an important accessory. Just like the iPad, however, the keyboard is not bundled with the tablet and is sold as an optional extra. You can of course use any Bluetooth keyboard with the Surface Go (just like with any other Windows device) but the Surface Go Signature Type Cover — as Microsoft calls it — does not need charging, and doubles up as a cover for the screen when not in use. It connects to the Surface Go via the connectors we mentioned earlier, and is pretty easy to snap on and off when you need. The Signature Type Cover is available in Platinum, Burgundy, and Cobalt Blue colours and is made out of the premium Alcantara microfibre material seen on some other Surface devices as well. At Rs. 11,799, that's a pretty expensive keyboard, which makes us glad that it's also available in black at “only” Rs. 8,699, using less expensive fabric. We got a black keyboard for testing from Microsoft, and while the Alcantara keyboards certainly feel more premium, the more affordable option still felt pretty good. Despite being fairly compact, typing on the Surface Go Signature Type Cover keyboard was a pretty decent experience. We found the keys to be well spaced out with decent travel for a keyboard of this thickness. The keyboard layout is fairly standard, with a row of thin function keys at the top. The backlight is a welcome touch, and a reminder to the likes of Apple that it's possible to add this feature without compromising on portability at least, if not battery life. Microsoft has also managed to pack in a fairly decent-sized trackpad with the keyboard, and we have no issues to report in terms of its performance. The Fn key can be used to alternate the top row of keys between standard function keys and special functions such as increasing/ decreasing the display's brightness, controlling media playback, and toggling the keyboard backlight. Print Screen, Home, End, Page Up, Page Down, and Delete are implemented as secondary actions for the function row keys. Apart from the keyboard, the Surface Go supports other Surface accessories like the Surface Pen, and the experience is pretty similar to what we've documented elsewhere. In short, while Windows has better native handwriting recognition than, say, iOS, and the Pen works pretty well, we don't think it's an essential tool unless you are an artist or prefer taking notes the old-fashioned way. The Surface Go has limited support for the Surface Dial, in that you can get it to work with the tablet, but it does not support on-screen interactions. A tablet is nothing but a giant screen with the internals to back it up, and it's safe to say that the Surface Go gets the basics right as far the display is concerned. The 10-inch display is arguably the highlight of the device, and it offers very good colour accuracy and viewing angles. It can get sufficiently bright, which makes it good to use in nearly all conditions. The display has a resolution of 1800x1200 pixels, and out of the box, Windows 10 is set to 150 percent scaling. We changed this to 125 percent to fit more content on the screen and still found it to be more than usable, though your experience may vary. 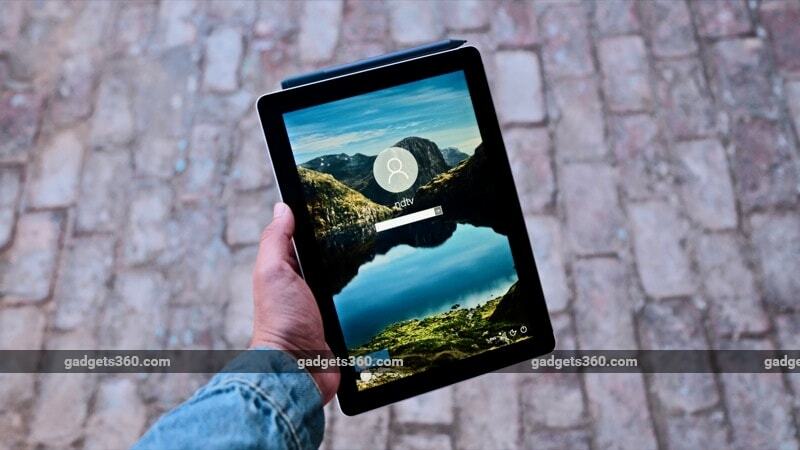 The Surface Go handled most basic tasks such as Web browsing, checking email, and watching YouTube videos without any problems, and you shouldn't expect anything less at this price. With that said, as we noted before, we got the more expensive variant in for testing, and the performance of the lower priced variant with just 4GB of RAM and slower eMMC storage will almost certainly be less smooth. Moving on to other benchmarks, we got a score of 32.59fps in Cinebench R15's OpenGL test, and a PCMark 10 score of 1,835, which is practically identical to what we got with the Smartron tbook flex and more than what the iBall Compbook Premio v2.0 scored. However, it's less than what the Rs. 35,990 Asus VivoBook 15 scored, though that machine has a much-slower, spinning hard drive and packs a display that's nowhere near as nice as the one on the Surface Go. In Geekbench 4, the Surface Go recorded single- and multi-core scores of 1,966 and 3,756. That's rather underwhelming compared even to the 2018 iPad, which scored 3,445 and 5,837 respectively in the same tests, and well short of what the more expensive iPad Pros manage. Using CrystalDiskMark, we recorded sequential read and write speeds of 1,200MBps and 88MBps respectively, while random read and write speeds with the queue depth set to 32 were 94MBps and 38MBps respectively. The Surface Go has an 8-megapixel autofocus rear camera and a 5-megapixel front camera. No one expects their tablet to be their primary camera, but the ones on the Surface Go will do a decent job if the need arises. The highlight here of course is support for Windows Hello, Microsoft's face recognition technology that's built into Windows. Using Windows Hello to unlock our Surface Go was pretty smooth for the most part. The Surface Go packs dual 2W stereo speakers with Dolby Audio Premium, and in our experience we found that while they can get fairly loud without sounding harsh, the resulting sound is still rather tinny. The Surface Go ships with Windows 10 Home in S mode, which means you can only install apps from the Windows Store. Of course, it's trivial to unlock full Windows 10 Home if you want, though this is an irreversible process. Perhaps more interestingly, we noted that the Surface Go has Windows 10's “tablet” mode disabled by default, which we found be a rather curious choice. Let us explain. Most, if not all, Windows 10 tablets and 2-in-1s can detect their current state and offer an optimised user interface. In tablet mode, with no external keyboard attached, these devices present a user interface that's optimised for touch devices, with large target areas and apps that open in full screen mode by default. When a keyboard is attached, they can revert to the traditional Windows interface with the Start Menu and Desktop at the centre of all user interactions. Out of the box, the Surface Go ships with tablet mode disabled, which means it shows the traditional Start Menu by default, even when there's no external keyboard attached. You're not prompted to toggle into tablet mode manually either, which is something we've noted with other devices including the Surface Book 2. 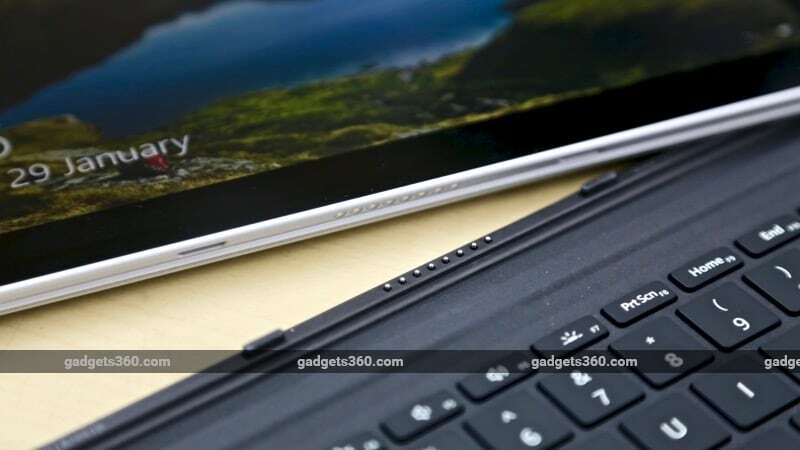 Perhaps this was done to offer something familiar to users on first boot, but we found this to be a curious — and even sub-optimal — choice, as the tablet mode definitely offers a better experience when dealing with a touchscreen. Other than that, the Surface Go offers pretty much what you would expect from a Windows device. This includes a true multi-tasking experience, compared to the likes of the iPad Pro. This means you can, for example, have a YouTube video playing in the background — newly launched YouTube Premium notwithstanding — even as you work on a Word document in full screen, something the iPad cannot do. Of course you also get full file system access access for external media, though the lack of a full-sized Type-A USB port might disappoint some people. In terms of battery life, the Surface Go was a little underwhelming. While the tablet lasted an impressive three hours in the Battery Eater Pro benchmark and around 11 hours in our HD video loop battery loop test — exceeding Microsoft's own claim of 9 hours of continuous video playback — our real-world experience was rather different. We struggled to get even four-and-a-half hours of usage from the Surface Go, even when we were doing nothing more than basic browsing, checking emails using Outlook, and watching an occasional YouTube video. For a device that's first and foremost a tablet, that's disappointing to say the least. Microsoft ships a 65W charger with the Surface Go, which will top up the tablet pretty quickly through the Surface Connect port. You can also use the USB Type-C port for charging, though you will obviously need your own charger and cable. The Microsoft Surface Go is a pretty interesting device that gives you a lot to like. The design is nice and premium, the display is excellent, and the performance is good enough for most everyday tasks. But who is it for? 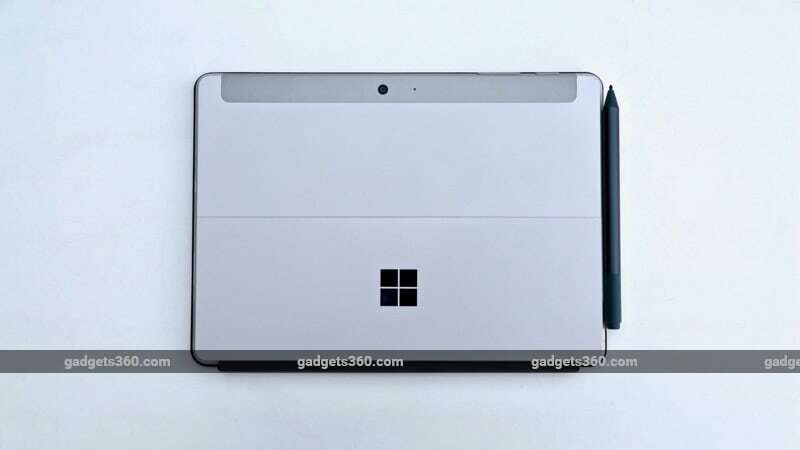 If you are looking for an extremely light and portable Windows notebook, the Surface Go and Surface Go Signature Type Cover combination could serve you well. We recommend getting the higher-end variant that we reviewed and the black keyboard cover, a combination that will set you back by nearly Rs. 57,000. Sure, that kind of money could buy you a laptop that's more powerful, but nothing will come close in terms of the portability and finesse that Microsoft's solution will offer. Yes, there are a bunch of Windows tablets that aim to do something similar at lower prices, but most of them end up making too many compromises, especially in terms of design and display quality. The only real problem with the Surface Go is its battery life, and that is truly disappointing for something that's otherwise designed to be used on the move. We also hope Microsoft launches the LTE option in India soon to make this machine a true road warrior, though that would obviously push the price even higher. With that said, if you are someone who's looking for a device that's a tablet first and foremost, you would be better served by the 2018 iPad or the iPad Pros. While we absolutely love the fact that Windows offers true multitasking without any restrictions, the iOS ecosystem is better in terms of the quality of tablet-optimised apps. product The Microsoft Surface Go is a pretty interesting device that gives you a lot to like. But who is it for? 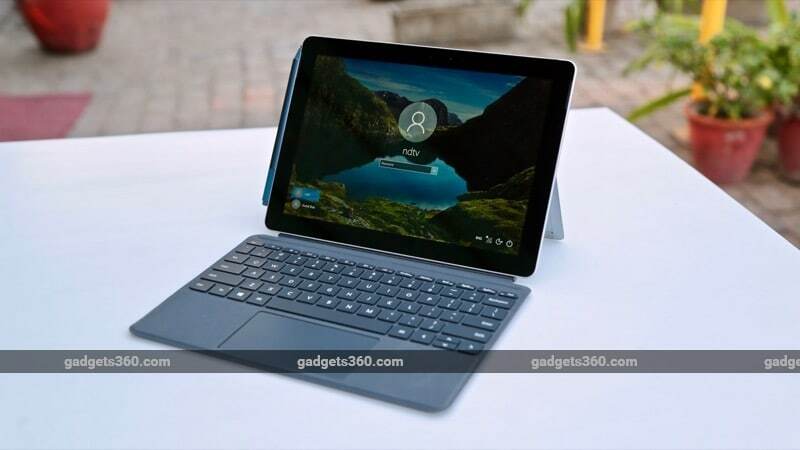 Read our Microsoft Surface Go review for more.